Carl e Sally Gable hanno deciso di raccontare in un libro un po' diario, un po' romanzo, un po' saggio storico, un po' raccolta di ricette, la loro scelta di acquistare Villa Cornaro e di vivere per parte dell'anno a Piombino Dese in una casa che è anche uno dei capolavori dell'architettura di tutti i tempi. Nel loro racconto scoprirete molte notizie sulla Villa, le loro idee e impressioni su Piombino Dese e sugli amici del Paese, le sensazioni provate nel trasferirsi in Italia, paese di storia e cultura diversa rispetto agli Stati Uniti. E c'è pure qualche pagina su nonno Memi e su nonna Francesca! In 1552, in the countryside outside Venice, the great Renaissance architect Andrea Palladio built Villa Cornaro. In 1989, Sally and Carl Gable became its bemused new owners. Called by Town & Country one of the ten most influential buildings in the world, the villa is the centerpiece of the Gables’ enchanting journey into the life of a place that transformed their own. 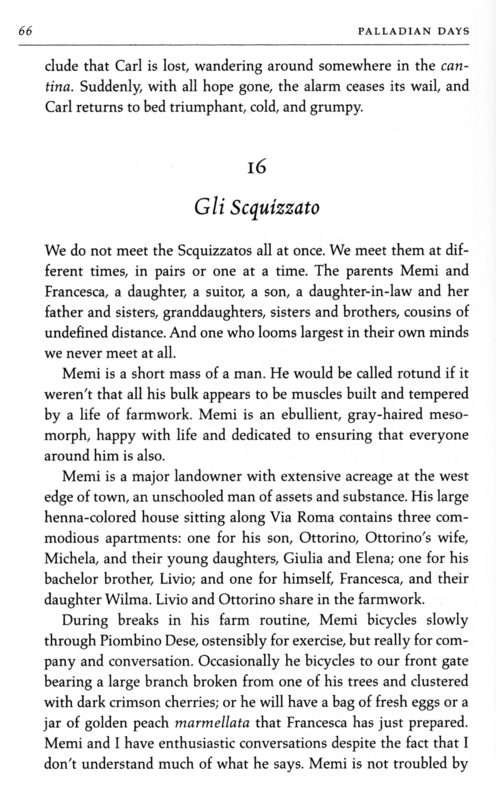 From the villa’s history and its architectural pleasures, to the lives of its former inhabitants, to the charms of the little town that surrounds it, this loving account brings generosity, humor, and a sense of discovery to the story of small-town Italy and its larger national history.